4 in 1 Magnetic Gauge  - $3.50 : Yarn Tree, Your wholesale source for cross stitch supplies. Item 4440. This handy gauge will tell you nearly everything you wanted to know before you stitch! 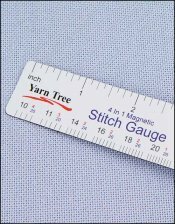 Magnetic 6” ruler with stitch gauge marks for 10, 11, 14, 16, 18, 20, 22, 25, 28, 32, 36, and 40 count fabrics. Hold the gauge to your fabric and match the lines to find the fabric count. Great for stores, too, when you have that mystery fabric on the shelf. Also gives suggested tapestry needle size and strands of floss to use for each fabric listed. Made in the USA.